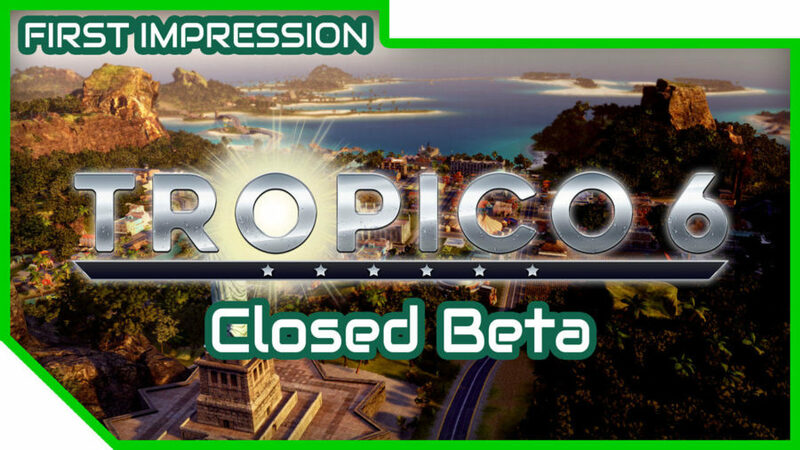 Kalypso Media gave closed beta access for those who pre-ordered their upcoming simulation game, Tropico 6. El Presidente, welcome back! 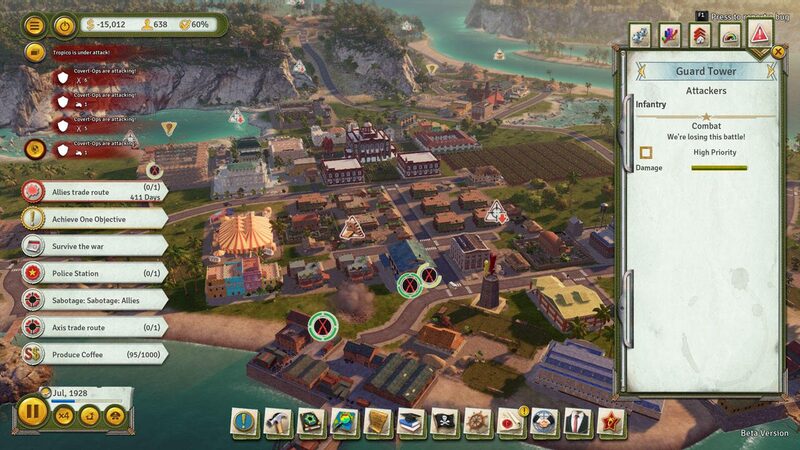 Tropico 6 is the sixth installment of the Tropico franchise developed by Limbic Entertainment, and published by Kalypso Media. 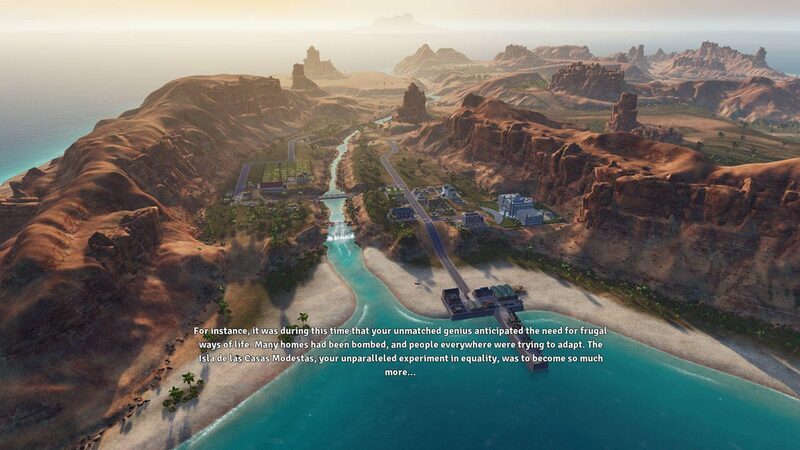 If you are new to Tropico series, Tropico 6 is being developed by a different video game development company, instead of the long-time developer Haemimont Games who developed Tropico 3, 4, and 5. Now, for the record, I have not really played any previous installments of Tropico, so this first impression would be totally unbiased. 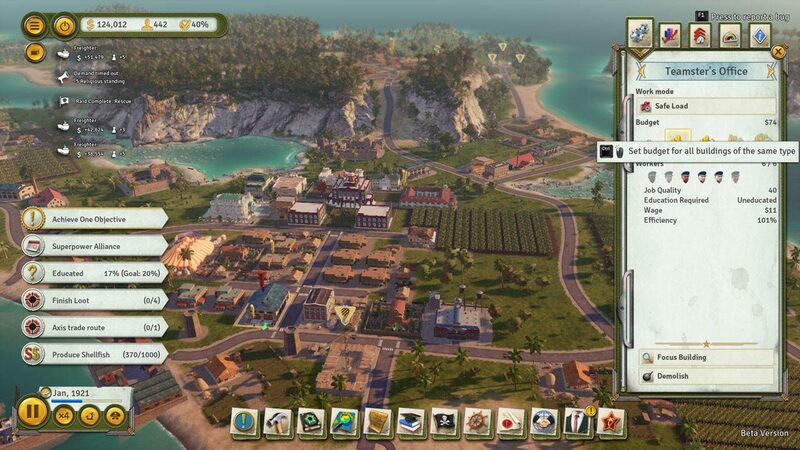 In the closed beta of Tropico 6, we are able to play either sandbox mode where we can play all we want, or we can play the mission-based scenarios to understand the game deeper, and also to give us a challenge. I have played the mission-based scenarios since they also teach me how the game basically works. 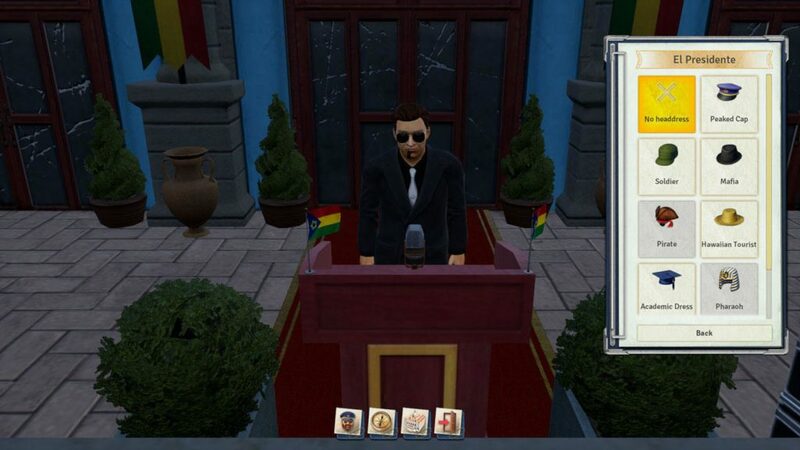 Before I proceed to the scenarios, we can actually customize El Presidente! Although, right now, I feel like it is still underwhelming and there are very limited choices to choose from. Hopefully, this gets better once they have released the full game. I also believe some of the items are locked and we have to complete certain missions or reach certain eras to unlock it. We can also give him a specific trait that actually boosts a certain gameplay aspect, such as being a Pyromaniac for example, it will increase the chance of building catching fire when he visited it, and in return, the efficiency of all fire stations we have built will increase as well. However, we can still choose the Kind of Normal trait so we do not have to deal with the boost and setbacks other traits may give us. 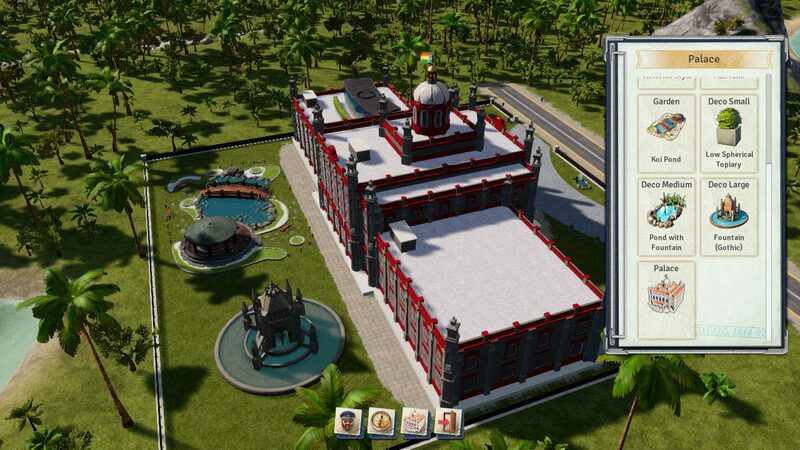 Not only we can customize El Presidente, we can even customize the palace. Similar to the El Presidente customization, the palace can be customized to our own liking. We can change the layout, the walls, the garden, the decorations and so much more. There are a variety of choices we can select, and I also wish that there would be more when the full game is out. Of course, some of the items are locked since we have to finish certain missions or reach certain eras to unlock them. However, I think it would be much better if the customization is more free reign where we can place the decorations or the buildings the way we like it, and not stuck with pre-defined choices. Just a preference. After customizing El Presidente and his palace (Note that we can customize it at will while playing sandbox/missions by clicking him), we may choose up to 4 mission maps which will help us how to play the game better. I have played most of them, and they are pretty fun and not restrictive at all. Although, of course, the missions in the closed beta are for beginners catered on teaching us how to deal with the game’s specific aspect, such as crime safety, logistics, residency, etc. On the other hand, if we play sandbox mode, we can choose how we win in the game, whether it is once we reach certain eras, swiss account money, or our own nation’s money. Although, I just prefer having just to build my own tropical city the best I could without having to be bothered that we can actually win the game. El Presidente! Check out your island! Before I talk about the gameplay aspects of the game, let me talk about how good the graphics is on Tropico 6. I did not play it on maximum settings, I rarely play games on maximum settings, but I can say that I genuinely like how the game is presented here. It is not the most gorgeous city-building game I have played, but I can say that it is one of the most refreshing so far. The variety of maps we can choose from, the terrains, it really does feel like a Tropical island, and there is just something refreshing about it. The calamities we randomly get are astonishing as well, there is this one time a meteor shower just hit my nation and several buildings went to flame. I must say, it is one heck of a visual to see it happened right in front of me. Even the volcanoes may erupt at any moment which can burn your mining buildings down. Zooming in the map itself will show us the people of our great nation, and I must say that they look pretty detailed enough for a game like Tropico 6. We can see them walk around, go to their work, go to their home. Although, I am kind of disappointed with the lack of animation, or maybe I have not looked into it more yet. The battles between armies are not spectacular either, and it is so damn loud especially when there are tanks. Visual bugs are also distinct in this game. Some ships just drift right into our land sometimes, El Presidente not showing up in the palace when conducting his speech, and citizens getting stuck on walking animations without any reasons at all. These are just small things that we probably would not notice anyway unless we really try hard looking to it. Speaking of missions, there are a variety of side missions or quests that we will get from different factions as we build our city. 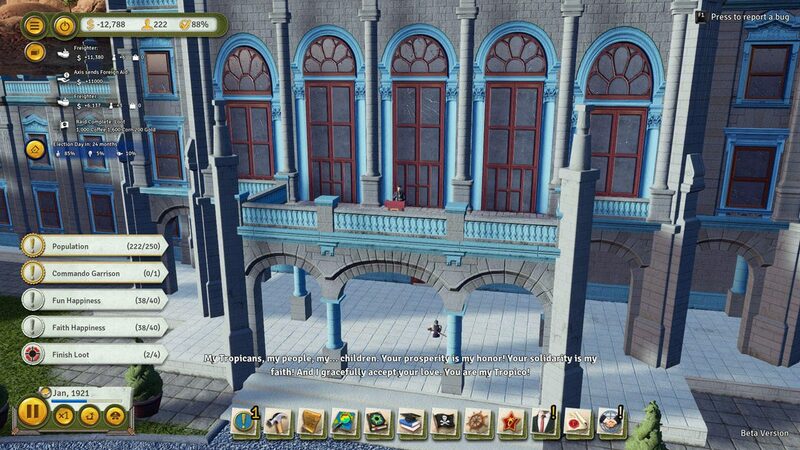 This, I believe, is one of the unique features of Tropico 6 in comparison with other city-building games. We have to weigh down which faction we should favor, or if we should be neutral to all of them. It is important to have approvals on all the factions since there are elections in the game, and rebels may spring up from a faction if they do not like how you run the city, especially if you just keep ignoring their request. This does not even include the superpowers that come into play in certain eras such as Axis or Allied, in which if we praise them and build an alliance would greatly help our financial need. However, the other superpower may not like us siding with the opposing side and even attack our own city. I prefer staying as a pacifist state (Yes, Tropico 6 lets us sign our own constitution), but some of the attacks literally destroyed half of the city and I was forced to create my own army to defeat the attackers. Manage your own nation, El Presidente! 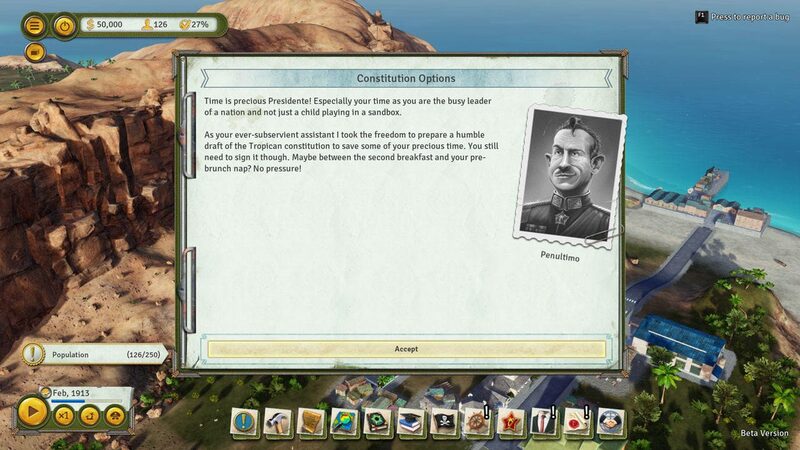 So how is managing a nation in Tropico 6? Well, I can easily say that the maps are decently sized as it is not overwhelmingly large nor too compact that not everything would fit in. Although, we have to keep in mind that the land is still limited and most of the maps are archipelagos, meaning is that the lands are kind of far from each other. Either we have to build a bridge, if we have the money, or use the Landing building to let people go from one island to another. Additionally, food and resources buildings, as well as, industry buildings have specific places that they can place into, it is not as restrictive as you think though. First of all, food buildings are fisherman’s wharf, plantations and ranches. These buildings can be placed almost everywhere, but if you want maximum efficiency, you have to place it where the soil is very fertile, so resources that grow from there are at its maximum pace. On the other hand, resource buildings are mines and oil well/rig have specific places that you can place them and the locations are actually quite limited as well. It actually becomes apparent to me that the mines and the soil of the land will be depleted or degraded after several years, and I would have to look for other mining areas or have it imported to me if it is really an important resource such as coals as they are needed for running a power plant. Of course, we can upgrade these buildings to slow the depletion of its resources while maintaining its maximum efficiency. It is a good challenge late in the game as well so we do not get rich from unlimited supplies of resources. I have mentioned about imports early on as imports and exports are one of the main aspects of the game’s economy. From my experience, 80% of my income came from exporting goods, and trade routes have to be unlocked by buying it. It is best to keep in mind that we need to have many trading routes for it to be profitable and it takes time for the ships to go back to the docks as well. Of course, it is best not to export all of your goods that the industrial buildings will not get any resources at all since a good example would be cheese is sold higher than milk. Milk is a resource from cattle, and cheese is created in an industrial building. Although, income can be gained from our own people, but the expenses would definitely kill the nation without exports due to wages and upkeep of each building. Be careful with these edicts! 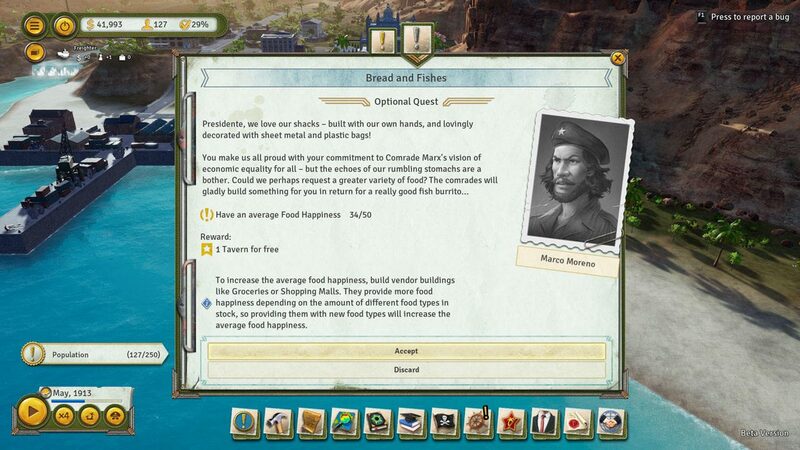 Other gameplay aspects of Tropico 6 are research and edicts where it may help our nation run better or worse. 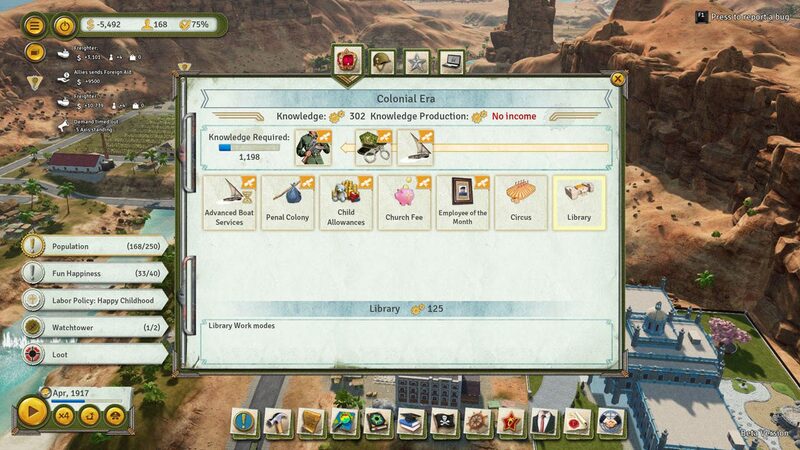 We can research edicts by building a Library or buying Knowledge from the Broker (easiest way to get Knowledge to be honest), we can also research additional options for buildings so we can optimize their efficiency more to our liking. Anyway, Edicts cost money and some edicts have cool down or levels to be better. Best examples of an edict with cool downs are industrialization and urban development, in which both edicts cut the cost of construction of industry buildings and residential buildings by 50%. These edicts are good to run if we are planning to build several buildings in a span of two years since it is the time limit. On the other hand, edicts with levels will just improve on its efficiency and decreases the setbacks every time it levels up. One of the best example would be Advanced Boat Services, where it increases the speed of your ships and boats while increasing its upkeep by a ton. Defending your nation may be quite hard as a Pacifist state! Lastly, aside from the overbearing loudness of tanks when the nation is at war, the sounds are pretty decent, and it has tropical vibe to the soundtrack, although I do not have the digital soundtrack since I do not have the El Prez Edition of the game. Dialogues are on point for all the major characters, although, I wish there would be more variance with El Presidente’s election speech since it seems to be the same thing all over again. The full game has been delayed until March 2019 as they want to crush some bugs and improve the overall gameplay, but from what I have experienced, I did not find a lot of gameplay bugs in the game nor I had major crashes. However, I do find it weird that building roads can be a head-scratcher sometimes, the AI and path finding need a lot to be desired as well. I mean, who the hell walks in the forest when there is a visible road few meters away from him. Would I recommend this game? Well, yes, if you are a fan of the series or city-building games in general. The developers obviously listen to the beta testers since they delay the game two months from its original release. From what I have read in the forum is that a lot of people have enjoyed this as well compared to Tropico 5 which is quite tedious on their DLCs and lack of base game content. Buy it here now: Play-Asia (Console), Humble Bundle (PC).